The Bow Trip, outside of Jackman, Maine, is one of the most well known multi-day paddle trips in the state of Maine, or for that matter in the Northeast. Traveled by many individuals each year it affords the paddler a place to experience the quiet beauty of the woods in Northwestern Maine. From scenic, island-studded ponds like Attean and Holeb to short, fun-filled class I and II rapids the trip offers something for all paddlers. 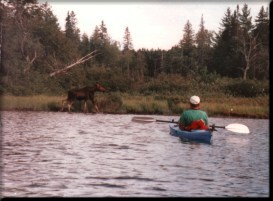 This paddle trip is located in the heart of the Moose River Valley near Jackman. From the south, it is very easy to get there. Exit 133 from Interstate 95 hits Route 201. The best instructions from there are "go north and stay on 201", Jackman will be there just before the Canadian border. The Moose River Bow TripThe town of Jackman was incorporated in 1859 and has long relied on the outdoors as a major source of income. The timber industry to this day employs more people than any other, while recreational pursuits come next. The town of Rockwood lies thirty miles to the east on Moosehead Lake and Greenville is another 20 miles south. Cabin on the Bow TripThe region has long been a favorite for the outdoorsman and it remains so today. Whether fishing, whitewater rafting, mountain biking, sightseeing or paddling one of the many lakes, ponds, and rivers, there are numerous possibilities for one to enjoy. Changes in timber harvesting in recent years has made tourism an increasingly important part of the economy. Lying a mere 17 miles from the Canadian frontier, there is a feeling of isolation whenever you venture onto one of the dirt roads in the area leading into the forest. For many paddlers, the Bow trip begins and ends in the same place, on Attean Pond just west of Jackman. There is a boat landing down the Attean Rd. where a section of the Moose River between Attean and Big Wood Ponds can be reached. For others, including most outfitters, the trip starts further north and to the west on Holeb Pond to avoid a mile long portage between Attean and Holeb Ponds. Holeb Pond is reached by an hour drive on well-used wood roads. Cry of the Loon offers shuttle service to avoid the one-mile portage. At Cry of the Loon Outdoor Adventures, we offer a variety of trips in spectacular Northwestern Maine. 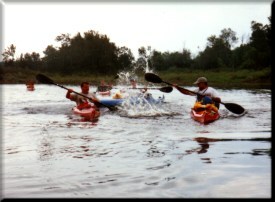 You can take a fully outfitted kayak or canoe tour from 1 - 7 days, including the famous "Moose River Bow Trip". We limit the number of guests so we can guarantee personalized instruction and top rate service. We encourage people of all abilities to join us. Leslie's cooking is excellent and our menu is flexible to meet your needs. We also offer canoe, kayak and paddle board rentals, and shuttle service for those who are doing it on their own. The wildlife in Northwestern Maine is exceptional. Moose, deer, beaver, great blue heron, loons, and eagles inhabit the region. Nothing compares to watching animals in their natural environment. Trips cover the Moose River Valley and the Moosehead Lake Region. Our season begins in mid-May and runs through mid-October. We offer full day and one-night fall foliage tours. Whether you are new to the outdoors or experienced and looking for something new, we are confident we have a trip for you. Don't forget to check our schedule.